"Here, everyone gets a free shot. It will burn a little bit but it will kill all the germs and you’ll warm up“, our guide said and passed a small cup of Rakia known as local (and very strong) brandy. "Cheers and bottoms up!“, she said and everyone drank. It was 10:00 am. "Now, since we followed Montenegrin tradition, we can proceed to breakfast!“, the guide added smiling while leaving the small dark smoked room where prosciutto is being made. 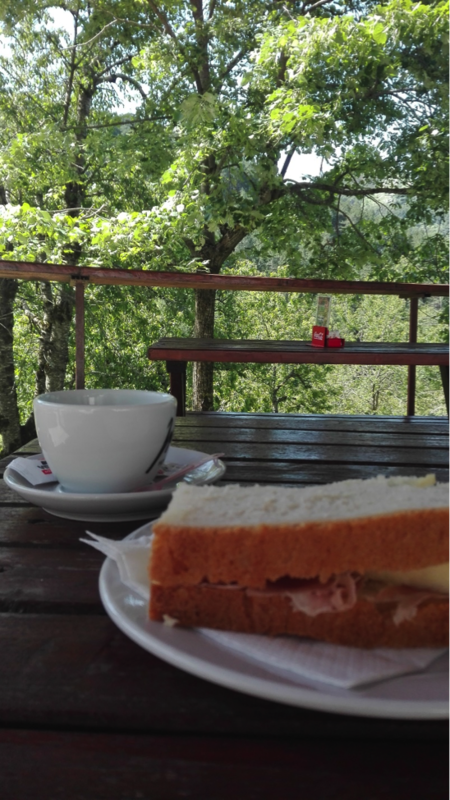 Just a regular morning at the oldest restaurant in Montenegro, Kod Pera pod Bukovicu. We started the famous Great Montenegro Tour from the office of 360 Monte travel agency. We’ve passed to the mini-bus just outside the walls of Kotor and headed to the mountains that were still blocking the sun even though it was 8:30 am. Sun was struggling with the huge black mountain, Lovćen, that we were about to conquer. It was so apparent how Montenegro got its name. We stopped at 9th serpentine to capture waking town of Kotor while the stupendous cruiser with 3.000 passengers was trying to reach the port of the Old Town below us. As we were driving higher, the cruise was getting smaller and the Bay wider and deeper. Each bent was rising us until we reached a vintage point from 1.000 meters of altitude at 25th bend. Boka Bay with its glacial origin reveals history of fiords, showing dramatic movements of land that had intimate and at the same time the most wild and passionate encounter with deep ink blue water. At some places its depth reaches impressive 60 meters. High elevations are definitely different appearance from other parts of Adriatic coast. When you see mountains growing up high like crazy, you’ll know you’re in Montenegro. o not think twice when it comes to boat ride! As that is optional on the tour (with surcharge), the whole group has to decide together. When you see the river and that crazy beauty, it will be very easy to make your mind.